It’s hard to imagine how the massive printmaking machines made it up the narrow staircase to the light-drenched, airy Pickwick Independent Press studio on the floor above SPACE gallery, but here they are: Goldie Hawn, El Camino and The Pix (handbuilt by Lisa Pixley, the founder of Pickwick). 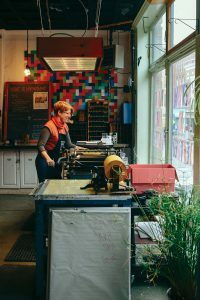 Pilar Nadal, a master letterpress printer, now owns the community print studio in Portland. “Energy begets energy,” Nadal says about the community made of emerging, learning and professional printmakers. “It typically takes more than two hands and one brain to make a print.” While members are responsible for their own “perishables” (ink and paper), they cultivate a democratic community that understands the space and equipment are shared. This is a selling point for many printers for whom owning this kind of equipment would be prohibitive. A growing pool of 25 members access the space 24 hours a day. The studio is quietest in the early morning hours and busiest during pre-holiday and pre-summer craft sale prep periods. 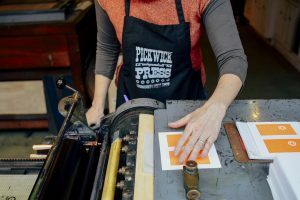 Nadal is dedicated to “giving people access to the shop no matter what they’re making.” While 99 percent of Pickwick Independent Press members have previous printing experience, some of them started their journey with a one-on-one workshop offered by Nadal. 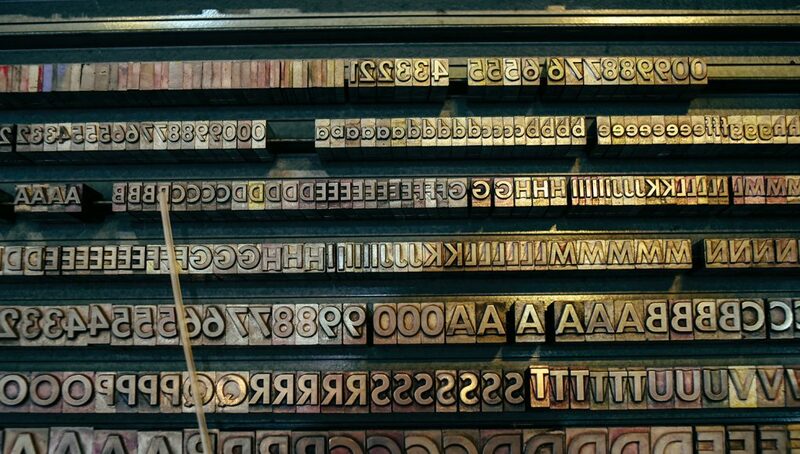 For $125, you can learn the art of screen, letterpress or woodblock printing. Nadal can customize a workshop to meet your needs and has crafted workshops for artists from other disciplines to help them realize their artistic vision. A multi-week intro class debuts in the spring. Nadal, the daughter of two craftspeople, always understood art as “a million steps to get to a piece at the end.” Her introduction to printing came during a trip to Penland School of Crafts in the mountains of western North Carolina. While her father instructed in the glass-blowing studio, 14-year-old Pilar took a stone lithography class alongside adult artists. The complex technique requires stone grinding. 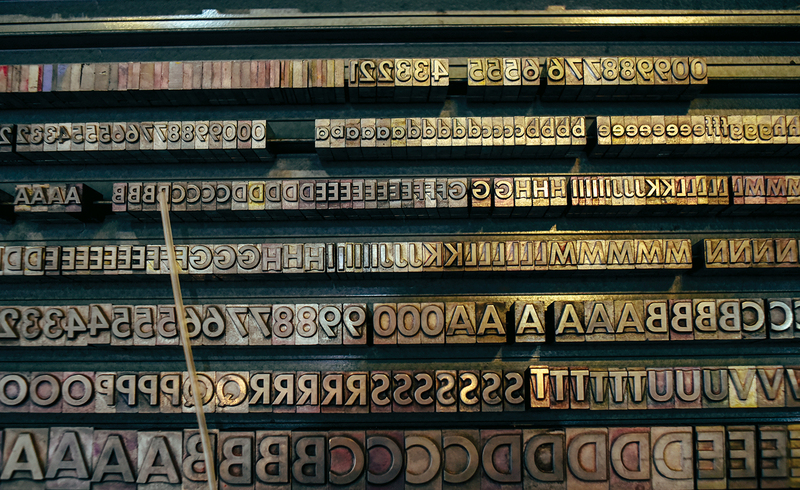 “It was probably the most rigorous, disciplined and difficult introduction to printing,” she says. But she was hooked. Since then printing has always solidified new pathways in her art. It’s a journey that has included Ithaca College, MECA, apprenticeships, a master printer program with David Wolfe of Wolfe Editions, teaching and a search for a dedicated space for to create. “To be a better art teacher,” she says, “I had to be a better artist.” Pickwick Independent Press was that space. The Pickwick Independent Press community is ever expanding. They partner with SPACE gallery, MECA and local public schools to provide fellowships, internships and workshops. Their annual calendar (which sold out in nine days this year) helps fund updates to the studio. “Printers Without Margins” is a liberal activist arm of the studio that creates postcards, posters and flyers. At a recent postcard session, participants made, wrote and sent 700 postcards to political leaders. The initiative is growing into an “Action Subscription.” Subscribers will receive monthly postcards and flyers. You can find Pickwick Independent Press artists’ work at the Makers Fair on Saturday, April 22, at the Portland Public Library and at the Book Arts Bazaar on Sunday, April 9, at the University of Southern Maine’s Wishcamper Center. Anna E. Jordan (annaejordan.com) is a writer and rowing coach. Follow her on Twitter @annawritedraw for news about #kidlit, rowing and politics.